We provide both resting and dynamic endoscopic examination of the larynx. 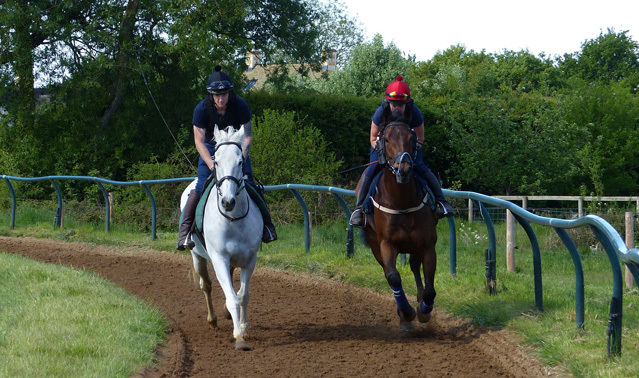 We have a deep sand circle gallop on which to exercise the patient and can provide horse and jockey to work upsides to simulate race conditions. Telemetric ecg allows monitoring of electrical activity of the heart during exercise and recovery. We are happy to accept referral cases for work up and for surgery with discussion and reports given to the primary vets. We are also able to review overground scope videos and offer a second opinion. Horses are asymmetrical, this is most significant when it comes to the anatomy of their larynx. The Recurrent Laryngeal Nerve which carries signals from the brain to the muscles of the larynx follows a dramatically looped route from the head to behind the heart and back to the larynx on the left side. The route of the right hand nerve is more direct. Hence we find the majority of larynx problems to be of the left hand side. Mild paralysis limited to the vocal cords results in a very typical whistle on the inspiratory phase of the breath. As a rule as long as the noise stays as a whistle throughout exercise and doesn't degenerate into a raspy roaring noise then a Hobday (Bilateral Ventriculectomy & Vocal Cordectomy) operation will usually do the job of removing the paralysed soft tissue which is causing the obstruction. Other than altering the tone and volume of vocalisation, there are very rarely any drawbacks or complications to Hobday surgery. Unfortunately in some cases the nerve supplying the laryngeal muscles degenerates further and the Arytenoid cartilage, which forms the frame for the laryngeal opening, collapses forming a persistent and severe obstruction to the airflow. In some cases the larynx may appear normal at rest only to find a total collapse after a mile of strenuous exercise. The flip side is that many normal horses look as though they have a degree of laryngeal paralysis at rest. Given a choice between scoping a horse at rest or listening to it canter on the lunge, the latter may be more informative. When there is severe laryngeal paralysis the only currently available option is Tie Back surgery. The objective here is to replace the paralysed nerve/muscle unit with a permanent stitch holding the cartilage of the larynx in the permanently open or semi-open position. The major flaw of this surgery is that the larynx is designed to shut when the horse swallows, protecting the trachea and lungs from contamination with swallowed food. Obviously the more we tie a horse's larynx back, the bigger the gap for food to travel down. Horses which can get away with a smaller laryngeal airflow (sprinters, polo ponies, eventers and hunters) don't need to be tied back so far and suffer fewer complications. It is the National Hunt racehorses which require the most air and the more extreme Tie Back and therefore have the most complications. One of the most easily treatable commonly occurring problems is Epilglottic Entrapment. 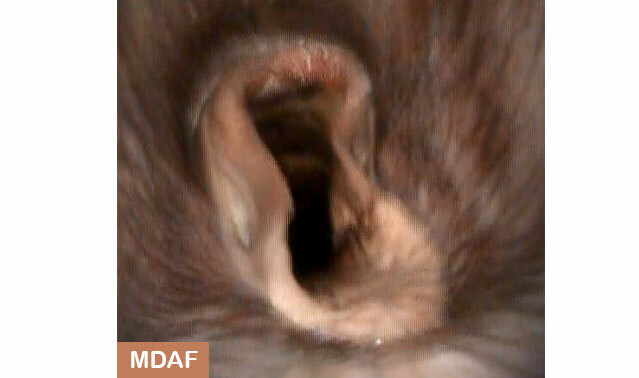 In these cases the tissue lining the underside of the epiglottis grows excessively loose and gets caught over the tip. This can cause a very sudden loss of performance and in some cases is difficult to detect as it will slip on and off the top of the epiglottis and be hidden when viewed at rest. Once the diagnosis is made the obstruction can be removed relatively easily in the standing horse using a laser. 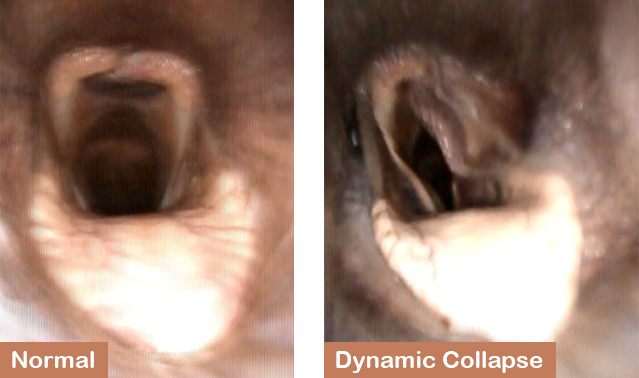 In other cases the elastic folds which connect the laryngeal Arytenoid cartilages and the epiglottis (Aryepiglottic Folds) can become an obstruction collapsing in and kissing each other across the front of the laryngeal opening. Again these can only be diagnosed at exercise with an overground scope. Once diagnosed the surgery to remove these folds is straight forward can be performed in the standing horse with a laser, complications are rare. In our experience of being involved with investigations of upper airway complaints over the last 30 years we have seen a significant increase in the number of racehorses being presented with complaints of cutting out whilst full of running at the end of a race with a coinciding abnormal snoring or gurgling noise. When investigated we find that by and large the soft palate is the cause of the airway obstruction and loss of performance. The soft palate is a thin muscular flap of soft tissue extending backwards from the boney hard palate which is the roof of the mouth. The soft palate seperated the mouth (below) from the nasal air passage above. When swallowing the soft palate flips upwards to prevent food falling down the nostrils. In the exercising horse the soft palate remains locked down under a notch below the epiglottis and larynx and should be held tightly forming an airtight "sucker" like bond onto the relatively massive tongue below. Problems occur when the soft palate displaced upwards and obstructs the airflow into the larynx. Assessing horses at rest is a rough guide but highly inaccurate. The only certain means of diagnosis is using the overland scope. In particular to this problem the type of exercise is critical, the horse's temperament also has a leaning on the problem. They are often the hotter less easy to settle horses. They typically pull hard and work well and then find nothing when under pressure or when "off the bridle". Without being too anthropomorphic, it's as though they are aware of the problem and are agitated by it even before they suffer the obstruction. With this in mind we find that overland scope investigation is often fruitless if the horse is relaxed and happy working on its own. It is an absolute must to have a horse challenging the patient at gallop as it fatigues as this is when the problem becomes apparent. We tend to see the problem present in two ways. The most dramatic is when the palate goes from appearing normal during gallop exercises and then abruptly flips up completely smothering and blocking the larynx. We see this presentation more often in the younger and shorter distance sprint horses. Peculiarly this problem can make a very loud snoring or gurgling noise or no noise at all. The most common presentation, particularly in National Hunt racehorses, is a billowing of the palate which starts slowly and progresses with fatigue. The palate separates from the tongue underneath and obstructs the airflow into the larynx. These generally make a rough noise both on inhalation and exhalation. Treatment of soft palate problems is tricky as no one surgery works consistently well for different individuals presenting with the same problem. We even find that there is a trend between trainers, where their regime seems to favour one surgery over another. The global veterinary research community have not found evidence that firing soft palates is significantly more effective than doing nothing. 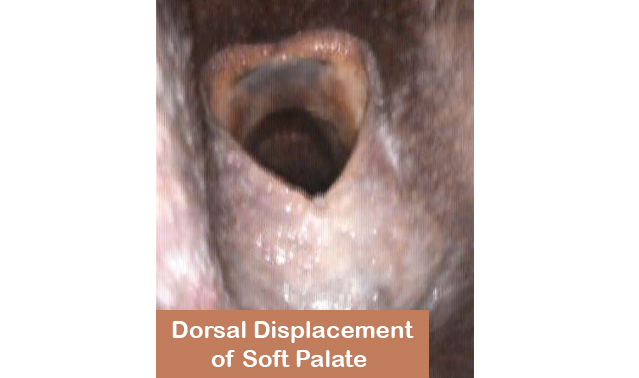 Yet we find that on owner/trainer feedback palate cautery seems to be the most simple and effective treatment for the majority of horses with palate issues. 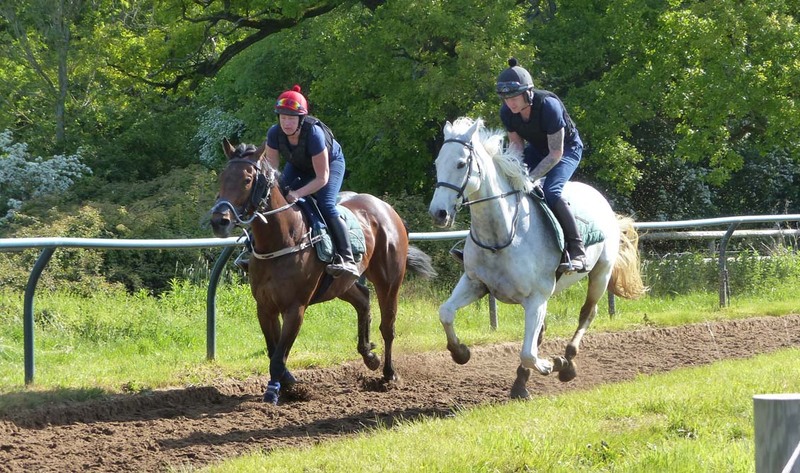 The problem with the research is that it is very hard to measure if the horse sounds better and has improved performance wise if they discard owner or trainer feedback as unreliable, which they do. We feel that our sternest critics are our owners and trainers and we trust them to let us know quickly if a procedure hasn't worked. We offer a free of charge overground scope post operatively for any horse that has been overground scoped pre op. This is probably the most numerous op we perform. It seems to work best for horses with a billowing palate rather than the sudden displacing variety. Whilst there are a number of clinics who are now performing this technique in the standing horse we have found that in our own hands the results are not as good. So we are currently operating within a short General Anaesthetic. We find that it is important for the success of this procedure to have the horse back in work as soon as possible. Results can be dramatic with an improvement or disappearance of the abnormal noise within 7 days. The normal routine is to start canter exercise after 7 days walking post op and plan for a run in 4 to 6 weeks post op. The main disadvantage with this technique is that the improvement is only temporary. The duration of benefit is highly variable with anything between 3 to 18 months. If successful once we find that a repeat surgery will give a reliable improvement albeit with a slightly reduced duration of benefit. Fig. Thermal Cauterisation - Progressive Billowing. Not to be confused with laryngeal Tie Back surgery (for a paralysed larynx). A Tie Forward is a more complicated surgery which aims to draw the larynx forward and tipping it away from the troublesome soft palate. The sutures replace the Thyrogyoideus muscle which has been proven to be the route cause of many palate problems. In theory it is a permanent solution. In the world the success of the op depends only the post-operative management of the patient, it is critical that they do not overstretch and tear the Tie Forward stitches by extending the head and neck and feeding or drinking from ground level. A strict management regime of a raised manger and water, no edible bedding and no turnout for at least 3 months post op. The actual return to ridden exercise is quite short at 3 weeks.